In 2014 the OECD carried out work to take stock of OECD countries' achievements in building resilience to major natural and man-made disasters. 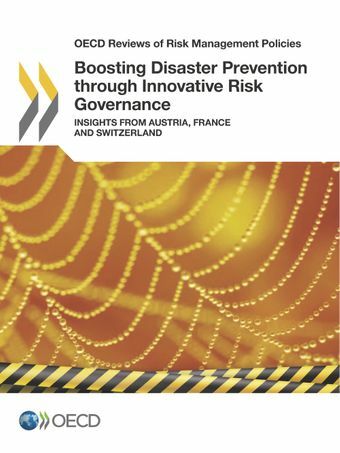 The report suggested that albeit significant achievements were made through effective risk prevention and mitigation management, past disasters have revealed persistent vulnerabilities and gaps in risk prevention management across OECD. Based on the findings of this OECD-wide report a cross-country comparative study was undertaken in Austria, France and Switzerland to test the recommendations put forward in specific country contexts. This report summarises the individual and comparative country case study findings. It highlights that the risk prevention policy mix has shifted in favor of organisational measures such as hazard informed land use planning or strengthening the enforcement of risk sensitive regulations. In the meantime, the great need for maintaining the large stock of structural protection measures has been overlooked and vulnerability might increase because of that. The report highlights the need for better policy evaluation to increase the effectiveness of risk prevention measures in the future. The report highlights practices where countries succeeded to make risk prevention a responsibility of the whole of government and the whole of society, by analysing supporting governance and financing arrangements. Regulation: Frameworks are not keeping pace with the changing risk environments, and enforcement tends to be inconsistent. Prevention: Disaster risk prevention measures receive insufficient attention from central government, but there is strong demand at the local level. When resources are tight, these tensions can be difficult to resolve, and a need to balance structural with non-structural measures. Infrastructure: There are significant challenges in ensuring that infrastructure maintain their original level of protection. Investment: Significant investments are needed for maintenance and strengthening of preventative structures. Whole-of-society approach: Despite widespread recognition of its importance, this approach requires significant energy and capacity to mobilise the wide range of parties involved. Risk awareness: Although risk communication is considered the most important prevention policy, countries still struggle with persistently low levels of risk awareness. Finance: Incentives are needed to increase private contributions to disaster risk prevention, as households may not protect their own assets due to an expectation that the government will do this for them. ‌‌Large-scale natural and human-induced disasters have generated over USD 1.5 trillion in economic damages over the last decade in OECD and BRIC countries. Single events have exceeded damages worth 20% of annual GDP. Resilience of OECD countries is particularly challenged during times of economic downturns, above all in countries that rely on state budgets for post-disaster loss financing. A shift in risk governance is required as governance obstacles hamper the effectiveness of current risk reduction investments. The report urges governments to address widespread disincentives that persist for governmental and also non-governmental risk management actors, leading to an over-reliance on the government for post-disaster risk financing.